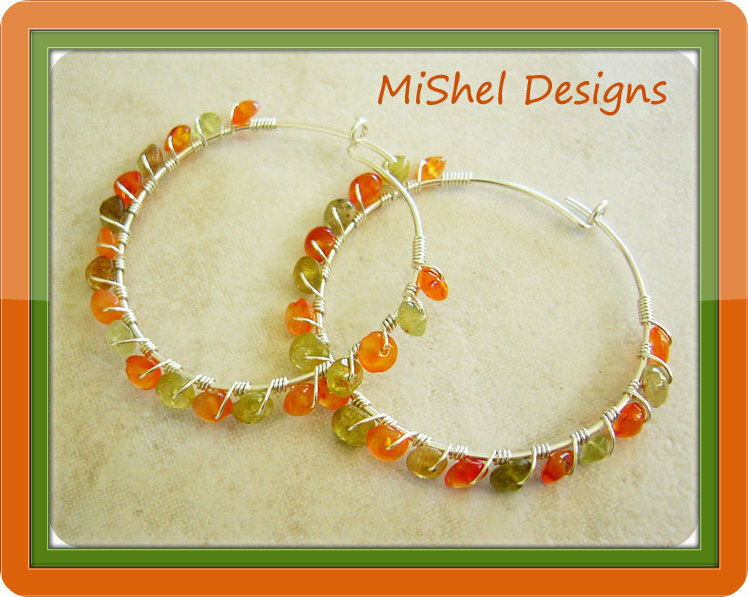 MiShel Designs: Jumping Through Hoops! Hoop earrings are always in style and if you practice making several sizes and embellishing them in different ways, then you’ll always have this essential earring staple to complete your wardrobe no matter what the current trends may be. 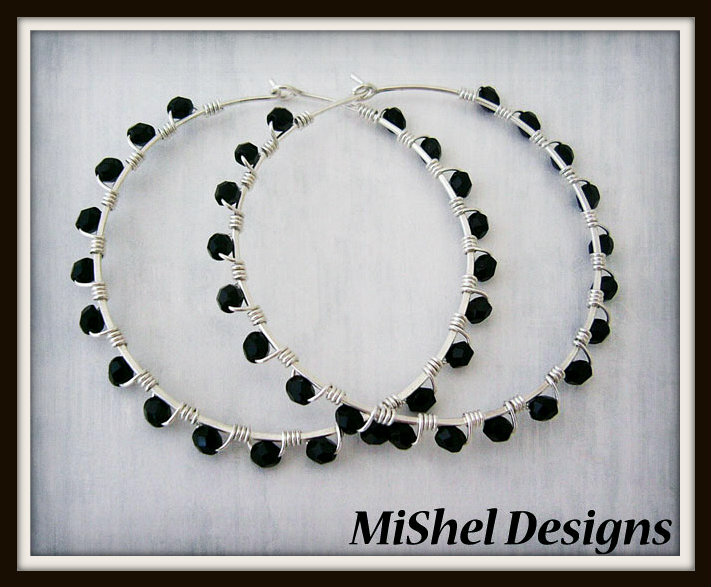 Here's a simple tutorial for creating some basic hoop style earrings. Flush cut two (2) pieces of 20g wire to your desired length. 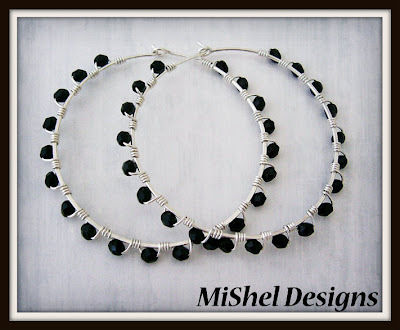 Your length will depend on how large or small you wish your hoops to be. For these photos I cut two, 5 inch pieces of wire. Make a simple loop on one end of each of your pieces of wire. To form the hoop portion, you will need a mandrel. This can be a fat marker, an actual ring mandrel, a nail polish bottle, a film canister or your looping or wrap-n-tap pliers. 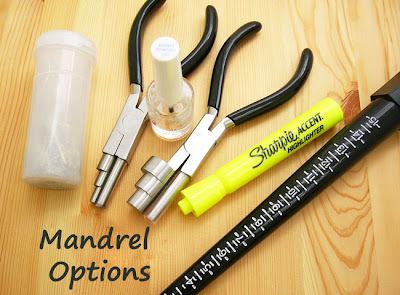 Wrap each piece of wire around the mandrel you've selected to form a round shape. To keep the shape you’ve created, you will want to lightly tap each ear-hoop with your plastic or rawhide mallet, either on your bench block or while it’s around your mandrel. Neither the plastic or rawhide mallet with flatten your wire, but it will work harden it enough so that your hoops will keep their shape. Take your jewelry file and smooth out the straight part of the hoop. This portion will go into your ear so you want to make sure it is smooth and won't scratch your ear. Grasp the straight part of the wire you just filed with your chain nose pliers, about 2 to 3 cm up, and bend it to a 90 angle to form the ‘hook’ that will fit into the loop portion of your hoops to close them. Lay your hoops on your bench block and hammer the bottom of the hoop portion to flatten it a bit. This not only gives it some strength, but some style as well. 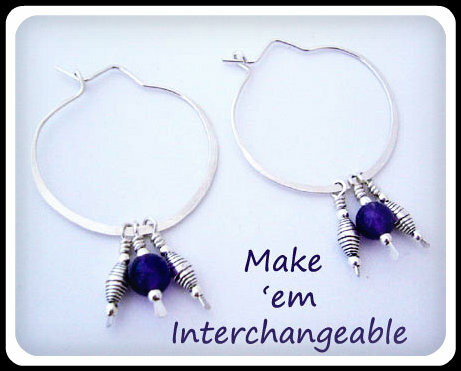 And, if you're planning on wire wrapping some lovely little gemstones or beads on to your hoops, this will help the wire from spinning around while you're wrapping! And remember, your hoops don't have to be round. 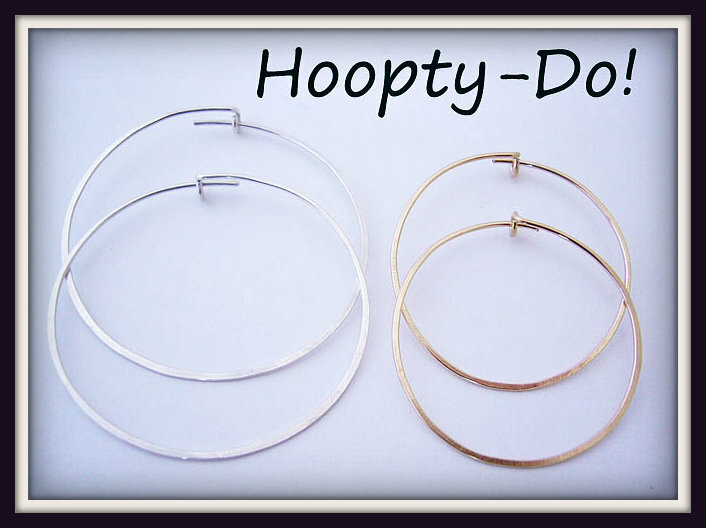 Oval hoops are quite fun and stylish, too! You can leave your hoops they way they are right now - simple and stylish - or you can embellish your hoops with bead dangles, wire wrap them with a different metal for a mixed metal look or you can wire wrap some fun beads on them to add color and texture. 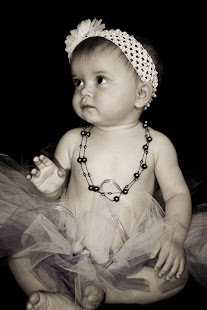 You can even wrap ribbons, leather or cord around them with wire or add charms or other beads for a truly unique and textured look! Whatever you do, have fun and Hoop It Up! Lovely! Thanks for the tut and the tips. Thanks for a very well-written tutorial! 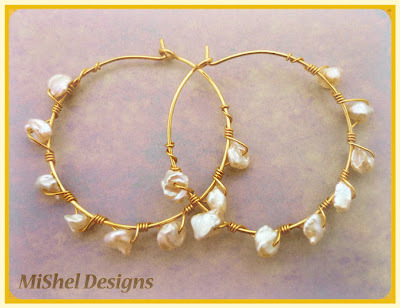 I LOVE hoops, and have tried making them, but they never stay "springy". Would the hammering do that? And what wire did you use? 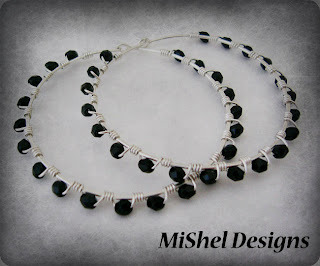 I have only used the "german" beadalon wire, no sterling silver yet. 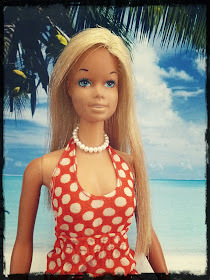 What fun for summer! 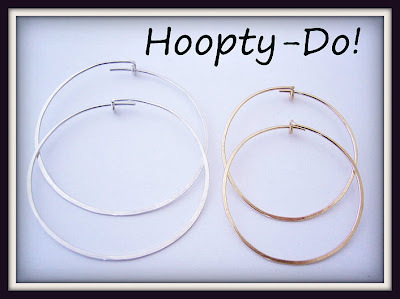 Love your hoops - all of them! These look great, Michelle! You do beautiful work. Kashmira - I used sterling silver. You can close the hoop, put it on your bench block and tap it with your rubber or rawhide mallet to get it to hold it's shape, and then when you hammer some of it flat with your chasing hammer it should help it to stay 'springy' and hold it's shape. If not, tap it a few more times,...and tap lightly all the way around the hoop - try that and see if it works for you. It does for me. Wonderful compositions. 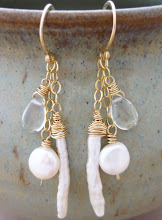 Beautifully designed earrings. Your photos and steps are so clear and helpful, Shel. Thanks for sharing the tute and beautiful designs with us. Agree BIG hoops are everywhere! Just made my first pair of hoops...with brown wire. Not perfect, but its a start :-)Thank you SO much!!! Oh yeah Kashmira!! I'm glad you tried the tutorial - I'm sure they turned out perfectly!! Thank you. Well written and described clearly .